Eloise Kelly, an intelligent American who has decided that true romantic heroes are a thing of the past, leaves Harvard’s Widener Library for England to finish her dissertation about Scarlet Pimpernel and the Purple Gentian, a dashing pair of spies. 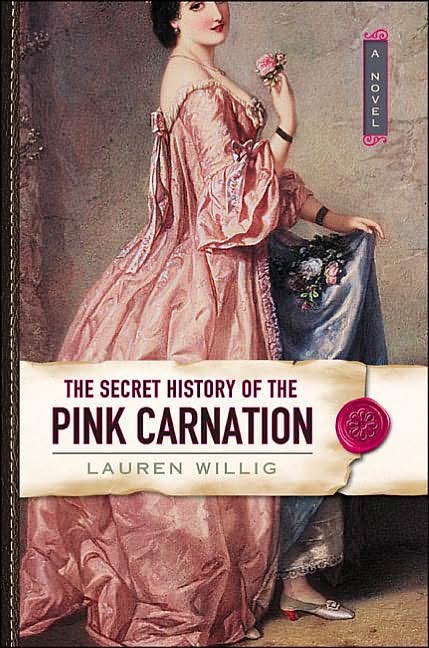 What she uncovers there is that which many historians have missed: a secret beginning with a letter dated 1803 and introducing the Pink Carnation-the most elusive spy of all time who single-handedly saved England from Napoleon’s invasion. Reading the secret history in hopes of unmasking the Pink Carnation’s identity, Eloise discovers a passionate romance that nearly changed the course of world events. Hannah Bonner and her half-brother Luke spend a year searching the Caribbean Islands for Luke’s wife Jennett. They find her but then have to travel to Pensacola to claim the baby Jennett had to surrender to a stranger to keep him safe. The family who has the baby is a very rich and powerful Creole family. New Orleans is on the brink of war and everything goes wrong for the Bonners, until they receive help from a family friend. When the bodies of two people are discovered in the remains of an arson fire that destroyed Glastonbury Abbey, Adelia Aguilar, Mistress of the Art of Death, is ordered by Henry II to determine if one of the sets of bones belongs to the legendary Celtic savior Arthur. Henry II imprisons Queen Eleanor in fear she and their sons will overthrow him and when his mistress is poisoned he sends for Adelia Aguilar to investigate the murder. Eleanor has escaped from prison and someone is trying to frame her for the murder. Adelia saves the Queen and learns of her plot to destroy the King. This book is a sequal to: Mistress of the Art of Death which was on loan from the Fremont Library.